Our Mission Statement: "Our mission is to maintain excellence, respect, and integrity in all aspects of our operations in order to deliver high quality plants and services that meet or exceed our customers' unique needs and expectations." Bron & Sons Nursery began in Grand Forks, BC in 1988 on a 20 acre field; today we have grown to approximately 100 acres of container production. We are a wholesale exclusive company, specializing in cold hardy, container grown nursery stock. Our unique climate and growing conditions as well as hardy seed sources allow us to produce a wide variety of hardy, high quality, retail ready plants, well suited to colder climates. We are committed to the best customer service in the business. Whether you are a wholesale nursery, retail garden centre, or a landscaping company in British Columbia, Alberta, Saskatchewan, Manitoba, the Yukon and Northwest Territories, as well as our US friends in Washington, Idaho, Colorado, Montana, Wyoming, Utah, North and South Dakota, and Alaska, we would love the opportunity to show you why our existing customers keep coming back! If you are not a registered user, please feel free to browse the public portion of our web site which includes our extensive Plant Reference Guide or some of the other Reference Material. 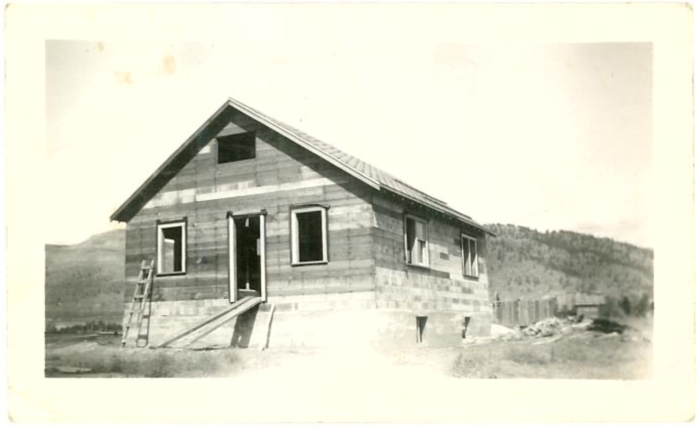 Original farm house on property, now our main office, circa 1950.